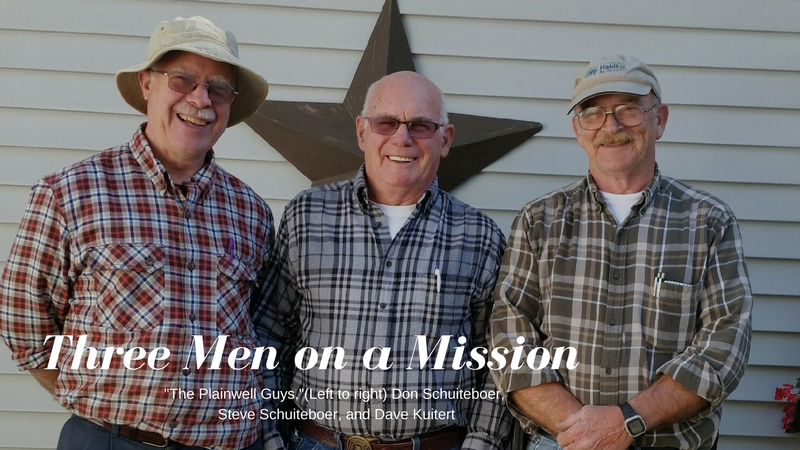 Brothers Steve and Don Schuiteboer and brother-in-law Dave Kuitert are three men on a mission, literally. Since 1989 when they traveled to South Carolina to help in the wake of Hurricane Hugo, their lives have been focused on helping others. They’ve traveled to the Gulf Coast and the Carolinas numerous times on disaster relief trips coordinated by UMCOR, the United Methodist Committee of Relief. Their next trip is scheduled for spring 2018. It’s something they feel called to do. “God has given us talents and gifts and we have to use them,” Don said. Don, Steve, and Dave heard Habitat’s call about a year ago and started volunteering regularly locally too. The trio, dubbed “The Plainwell Guys” by Habitat’s construction staff, volunteer several days a week, mostly on home repairs. Don likes the variety of tasks the repairs present and feels that working several days a week provides continuity. Don also volunteers with Allegan Senior Services and coordinates volunteers for repair projects. “I learn something every day with Habitat that I can apply on mission trips or on another repair project,” Don said. To learn more about Habitat volunteer opportunities, contact Director of ReStore Operations and Volunteer Services Michaelyn Denny, 269-344-2443, ext. 204 or mdenny@habitatkalamazoo.org. For information on Habitat’s home repair program, contact Director of Homeowner Services Sylvia Denning, 269-344-2443, ext. 211 or sdenning@habitatkalamazoo.org.